Did you know that a chestnut orchard is thriving in the foothills of the Blue Ridge Mountains? It’s true. Virginia Chestnuts is a family owned and operated orchard that has deep roots in the heart of Nelson County. Although orchards can take many years to establish, their chestnut orchard yielded a robust harvest in 2017, which generated a lot of buzz and interest from local bakers, brewers, and distillers. The story of the chestnut tree is one of survival. American chestnut trees were once grown in the United States but most trees succumbed to a bark disease, known as blight, in the early 1900′s. Still wanting a seasonal favorite, consumers began buying chestnuts from Asia and Europe. Today, many of the chestnuts consumed in the United States come from Italy, France, and China. Virginia farmers David and Kim Bryant dreamed of bringing the chestnut back to Virginia. David grew up in a cattle ranch family and Kim is a year-long gardener; both love being outside. They have had professional careers in the software development industry and are starting to look at a second career as they enter retirement in the next 10 years. 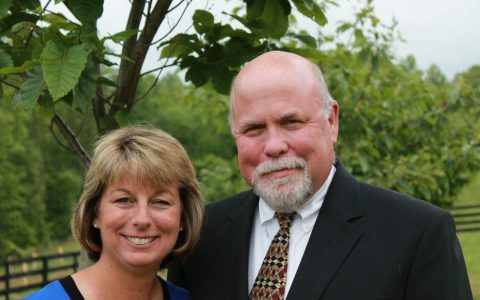 The Bryants, both 53, purchased land in Nelson County, VA in 2003. After clearing the acreage needed for chestnut trees they began buying, planting, and growing 200 test trees to see if the crop was viable in the Virginia soil. Indeed, it was. They purchased and hand-planted more than 1,600 Dunstan trees, an American-Chinese hybrid. Although blight resistant, they are not weather resistant. Between 2009 and 2014 the orchard experienced a harsh winter and later cicadas that threatened the trees, but in 2015 things began to turn around for the better. The 2015 harvest yielded a bumper crop of chestnuts, which enabled the Virginia Chestnuts to reach out to locavores and food hubs to gauge interest. The nostalgia for chestnuts appeared to drive the demand. Many pounds of Virginia Chestnuts have been hand delivered or shipped and then re-introduced to the American palate from Nelson County, to Richmond to Washington, DC. This year’s harvest has been the best yet, yielding at least 3,000 pounds of chestnuts. This will increase exponentially as the years go by. “We’ve had our challenges along the way, that’s for sure, but we believe it will be worth it down the road,” says Kim. The Bryants are not the only chestnut growers in the area. They are part of a chestnut growers group of 5 orchards in Nelson County, trading tips and strategies to help each other succeed. The schedule for chestnut harvest begins in mid-September and ends in late October. All of the chestnuts grown on the farms are harvested, processed, and stored on-site, until the Bryants deliver or ship. The harvesting happens as soon as the nuts, which are covered in a bright green husk that resembles a spiky tennis ball, start to fall to the ground. They are then picked up by a harvesting machine and a few by a hand harvester called the ‘nut wizard’. “The nuts fall to the ground and we have a machine that comes along and picks them up. We sort through them and throw out bad ones. They go through a process where they’re graded, washed and sanitized, and then they’re dried and put in cold storage,” says David. After that the nuts keep in the refrigerator for up to month. Once stored, nuts are ready for roasting! Buyers have the option to buy whole or retail and the Bryants provide a fresh, raw product still in the hard shell, or, if needed peeled. Peeling can slow down a baker or chef with an already tight cooking schedule. Most weekends in November, the Bryant family has roasted chestnuts, sampled chestnut dishes, and swapped recipe ideas with folks at Dickie Brothers Orchard nearby in Roseland, VA, where it was also apple and apple cider season. The chestnuts were roasted on charcoal over apple wood to enhance the flavor, cooled slightly, peeled and eaten as a healthy snack and also sold raw in the shell. Many people who have never tried a fresh chestnut it is a unique flavor. For the more experienced crowd, bringing back a “taste of history”– the company motto, appeals to the wistful traveler who has been to Europe where roasted chestnuts are a holiday staple, in the same way popcorn is ubiquitous across American movie theaters. This year, Virginia Chestnuts was invited to in Fire, Flour & Fork, a mix of dining events, demonstrations, talks, food producers, distillers, craft beer producers, cookbook authors and visiting chefs in the Richmond area. The Virginia Chestnut family roasted chestnuts at the “Smoke on the Water” event that took place overlooking the James River during sunset. A sumptuous and inviting spot to dine on a variety of farm-to-table foods cooked by top chefs from around the country Roasting chestnuts and serving them in paper-like cones evoked the experience people have when traveling European cities and also New York City where street-vendors are a part of the holiday experience. Chestnuts are not only enjoyed roasting on an open a fire, but also in many dishes, including those eaten by the vegetarian and vegan crowd, so the appeal is far and wide. Virginia Chestnuts have been baked in breads, Thanksgiving stuffing, brewed into beer, blended into unique restaurant dishes, luscious desserts and more. So far, nostalgic foodies are delighted to use this local ingredient in their seasonal sweet and savory dishes. The word is out and people are delighted. Virginia Chestnuts are all over social media and the orchard has a burgeoning Instagram following. Kim and David are delighted when someone asks where they can get their product. Have you considered your December holiday menus? If not, you should. Virginia Chestnuts are going fast but you can visit www.virginiachestnuts.com to buy them for the next party. Learn more about the love that goes into each planting, each tree. When people say “it’s a labor of love”, it’s true. This hard work pays off with the knowledge that an American tradition can be brought back to life with discipline, sweat, a few tears, and a passion for farming. In a nutshell, that’s Virginia Chestnuts. Bio: Lauren Evoy Davis is a freelance writer who resides on the Chesapeake Bay.